1869 document where Henry O. Kent, Justice of the Peace, is certifying that he married William H. Veasey and Miss Lucinda M. Potter, both of Stark, New Hampshire, on September 15, 1869 at Lancaster, New Hampshire. Note that William's surname is spelled two different ways on the document and yet a different way on his gravestone: Veasey; Veazie; Veasy. 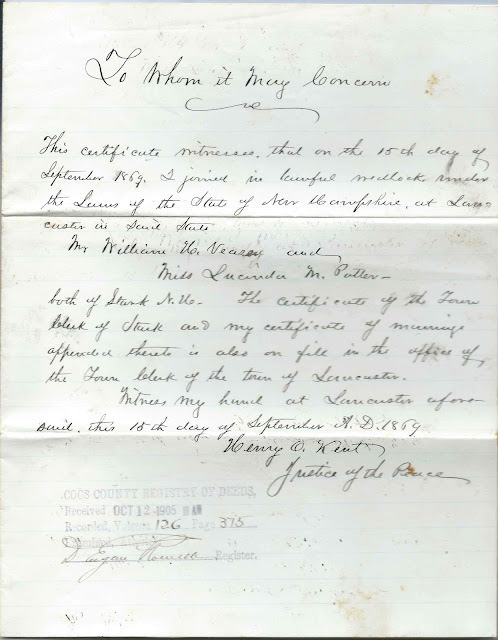 This certificate witnesses that on the 15th day of September 1869, I joined in lawful wedlock under the Laws of the State of New Hampshire, at Lancaster in said State. Mr. William H. Veasey and Miss Lucinda M. Potter, both of Stark, N.H. The certificate of the Town Clerk of Stark and my certificate of marriage appended thereto is also on file in the office of the Town Clerk of the town of Lancaster. 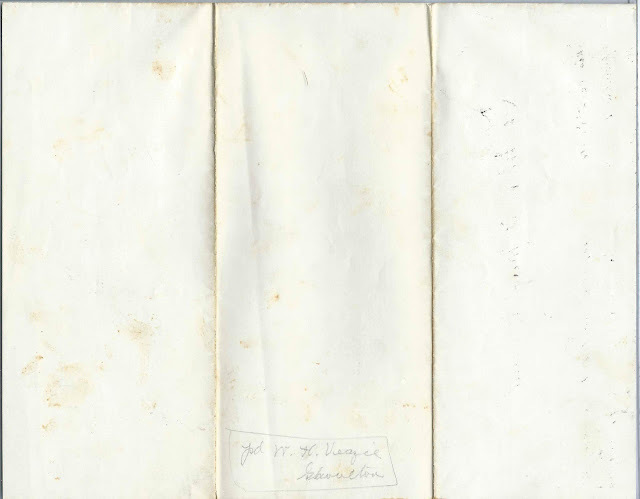 Witness my hand at Lancaster aforesaid, this 15th day of September A.D. 1869. According to information on their monument: William Henry Veasy and Lucinda M. Potter were both born in 1847. William was born in Groveton, New Hampshire, the son of John Veazie and Lucy (Hall) Veazie. 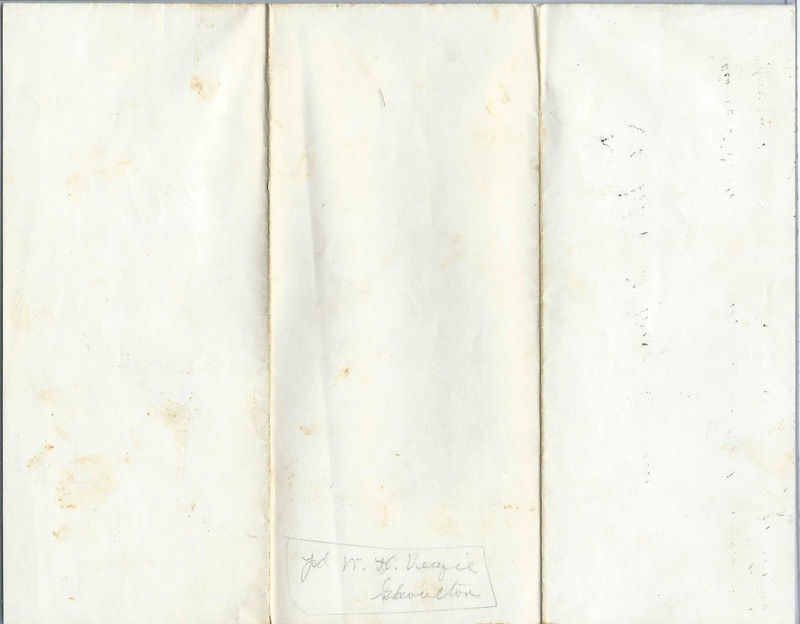 [Notice that Groveton is written on the back of the document.] Lucinda was born at Stark, New Hampshire, the daughter of Justus M. Potter and Hannah (Dodge) Potter. William and Lucinda made their home in Coos County, New Hampshire, and had at least two children. William, who died in 1910, and Lucinda, who died in 1920, are buried in the Northumberland Cemetery at Northumberland, New Hampshire, under the surname Veasy. Justice of the Peace Henry Oakes Kent is buried in the Sumner Street Cemetery at Lancaster, New Hampshire. His Find a Grave memorial shows a photograph of Col. Kent and gives a family history. If you have information on the Veasy/Veasey/Veazey/Veazie, Potter and/or Kent families, please leave a comment or contact me directly.